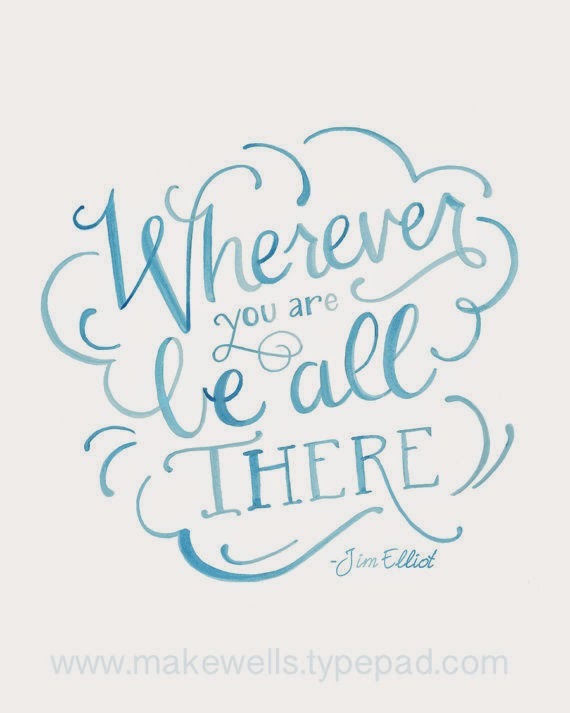 Jim Elliot said, "Wherever you are, be all there." In this time of constant distractions and supreme busyness, I believe that this is a very important practice and it is one in which I want to excel. I feel like I am constantly not in the moment: when I am with my kids I am not really present or when I am at work I find myself thinking about my kids, housework, that committee work I need to do, and . . . These are really important things that I am very committed to and I still can't get it right. This happens to me dozens of times a day. My brain wanders to my running to do list during a meeting or to that email that I need to write or call I need to make when I am cooking dinner. I really want to make this change so I am committing myself to training to be present in the moment. In my case I think there are many causes and ways that I can improve my ability to be present. One of the big causes (identifying these has been an important first step) for me is sheer over commitment. I need to be more intentional about what I say "yes" to and say "no" more. I have realized that my capacity is not limitless and accepted that it is okay. Another cause for me comes from not planning well enough. If I am able to plan my tasks to a specific block of time I find it easier to "remove" those lingering thoughts because now I have a place for them. This is really harder when I am tired so getting enough sleep is really important too. I also find it easier to be present if I am focused on my listening skills. Being an active listener is something that I highly value and it is almost impossible to not be present when you are focused on really listening to another person. Is this something that you are working on? What works for you? Follow us on Pinterest to be inspired by more beautiful words.